Rug braiding is a craft nearly anyone can learn. A simple braid is combined with a uncomplicated process to create a beautiful rug. Each is one of a kind, often made with wool or recycled material, and can be made nearly anywhere – your home, at a class, or on vacation. Pam Rowan is an award-winning rug braider and teacher. 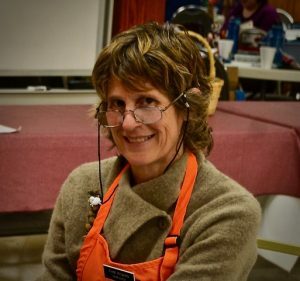 She has taught all levels of braiding at rug braiding events throughout Maine, New Hampshire, and Massachusetts. Pam is known for her beautifully colored rugs as well as her creativity in designing braided bags, baskets, and turtles. She also specializes in repairing old rugs, giving new life to old family keepsakes, and helping others design their own new rugs. Read more about Pam here. For additional event information, please see our calendar of events.